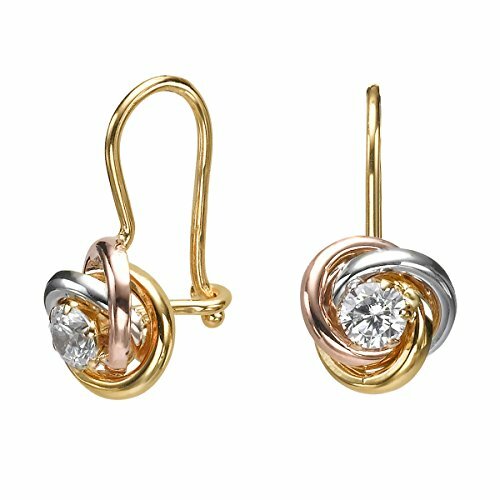 High quality hoop earrings made of solid 14K gold. With hanging decoration of three large intertwining circles of yellow gold, white gold and red gold. Bejeweled with a large high quality zirconia stone. ♥ The item will come with a beautiful gift box, ready to be gifted. Just for you to know, we have an amazing collection of Hoop, Dangle and Huggie earrings. We're delighted that you have joined the circle of satisfied customers of youme, and are certain you will have enjoyment from your jewelry for many years to come. Enjoy your staying and feel free to contact us with any question. Suitable For Babies And Little Girls. If you have any questions about this product by youme Gold Jewelry, contact us by completing and submitting the form below. If you are looking for a specif part number, please include it with your message.